GAITHERSBURG, Md., October 17, 2018 /3BL Media/ – Sodexo, a food services and facilities management company committed to improving Quality of Life, announced today a North American Single Use Plastics Reduction Plan that will eliminate single use plastic bags and stirrers by 2019, polystyrene foam items such as cups, lids and food containers by 2025, and shift straws to a “by request” item that will still be available to customers who need them while moving toward more sustainable materials. 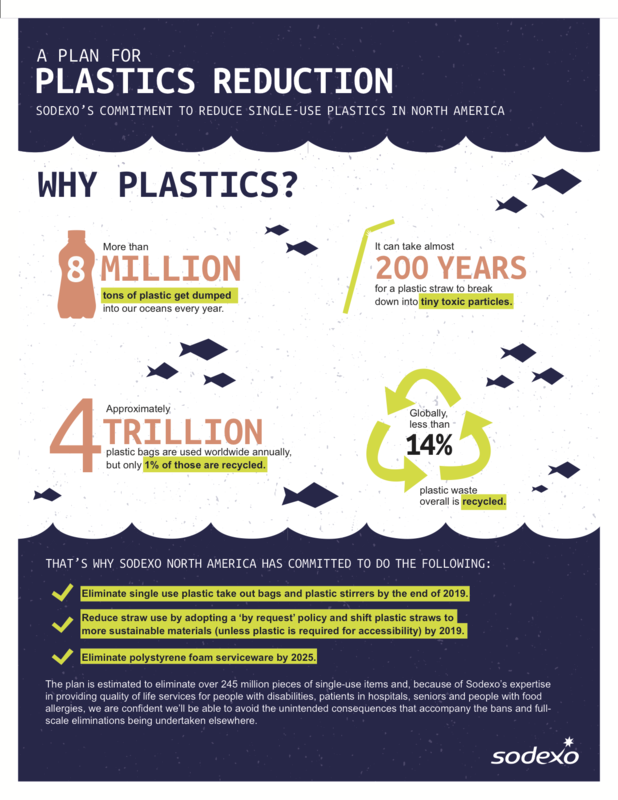 This Single Use Plastics Reduction Plan is merely one step in Sodexo’s global effort to reduce environmental impact, as the company will continue to research and introduce new innovations such as re-usable materials, bioplastics, and organic materials in its effort to eliminate avoidable waste going to landfills. “We support efforts to prevent waste. However, it’s important to remember that for many people, these aren’t convenience products, they are necessities. We’re happy to provide Sodexo with guidance that ensures their facilities are fully inclusive of people with disabilities and are fully accessible to everyone,” said Jill Houghton, President & CEO of Disability:IN. Sodexo’s policy will eliminate over 245 million pieces of unnecessary single use items. For plastic straws and stirrers alone, the reduction plan will eliminate a volume of plastic straws and stirrers that, if laid end to end, would reach from North Pole to South Pole…twice. Sodexo acknowledges that waste is one of our planet’s biggest collective challenges. Through its Better Tomorrow 2025 corporate responsibility roadmap, the company has committed to eliminating avoidable waste globally by 2025. But given its expertise in ensuring quality of life services for people with disabilities, patients in hospitals, seniors, and people with food allergies, Sodexo is applying a targeted approach that will avoid the unintended consequences that could accompany full-scale elimination. Perhaps most importantly, Sodexo is continuing to collaborate with clients, supply partners and NGOs on innovative and more sustainable solutions. For more details about Sodexo’s Single Use Plastics Reduction Plan are available on SodexFoUSA.com.